Yesterday was the first day of Spring. 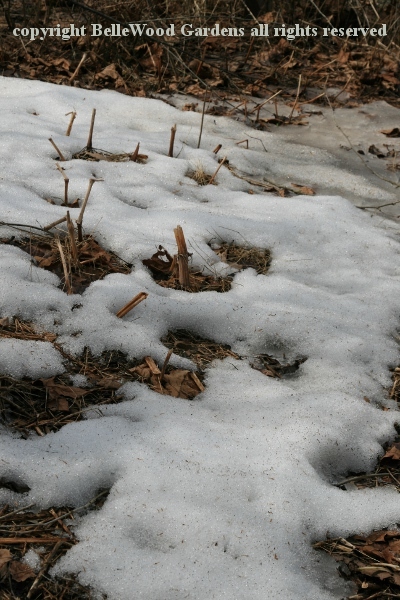 If you were hopeful that the snow would have vanished and the flowers hurled themselves forth from the earth in welcome to the season, think again. 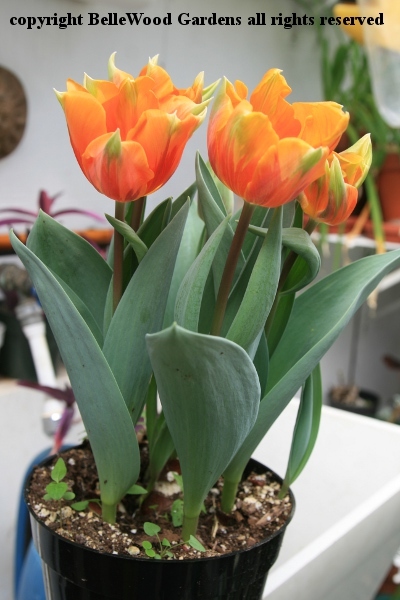 Yes, I'm enjoying this potful of Tulipa 'Prinses Irene'. However, as you can clearly see the pot is in my greenhouse. Sigh. 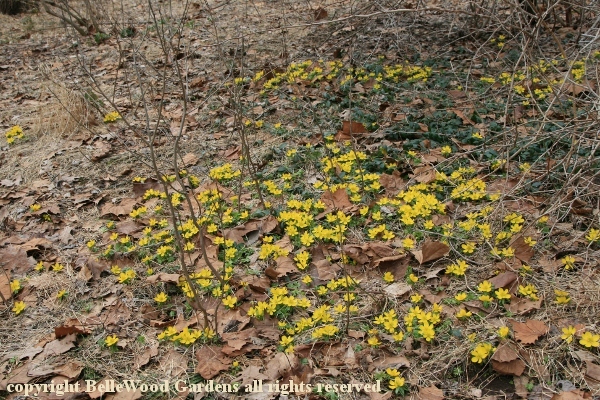 However a saunter down into the woods reveals that yes indeed, there are flowers in bloom in welcome to the season. Come on, put on your boots (it's a bit muddy) and a jacket and let's go for a walk. 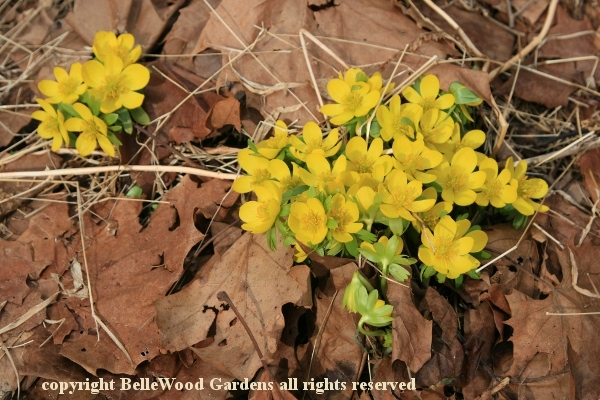 Always welcome with their golden flowers shining above a Toby-ruff of green, the winter aconites, Eranthis hiemalis, have sprung into flower. Once established in a garden - difficult from the dried and withered little tubers offered for sale in the fall - anyhow, once you establish a few they'll seed about rather prolifically. In fact, they can become rather excessive. But who cares. Not I, as they cast their golden coins of sunshine across the still rather barren landscape. 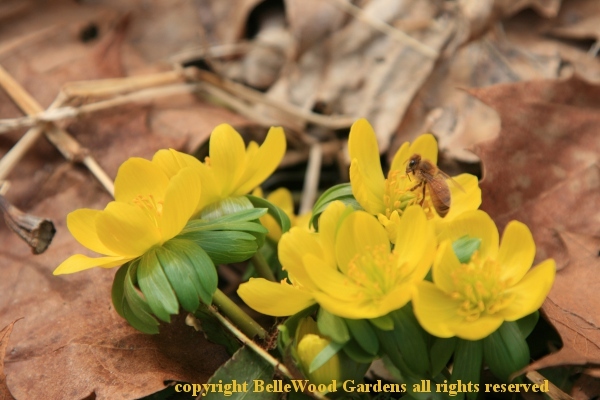 And certainly not the honeybees, desperate for pollen and nectar. 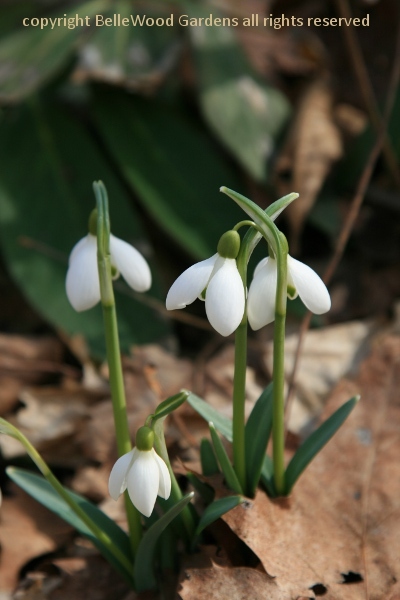 Snowdrops make an equally late appearance, delayed at least a month by the excessive snow. 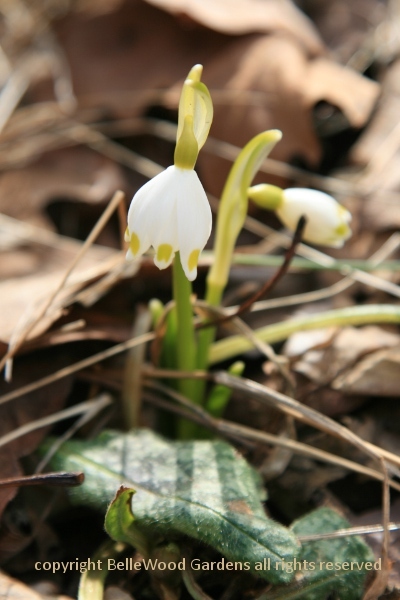 Not snowdrop but instead snowflake, Leucojum vernum, just a few, and etiolated, yellowed from their overlong snow cover. But soon there will be more. 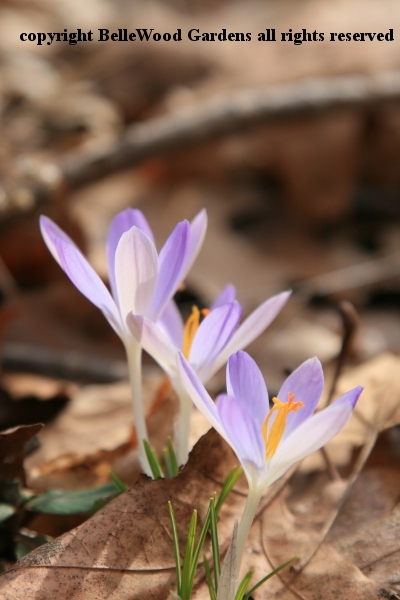 Crocus tommasinianus opens in the Spring sunshine. The hellebores are looking quite shabby. I haven't been able to do the necessary tidying up to their winter damaged foliage. I need to get out here with some clippers and get to work. How nice it will be, to again work in the garden. 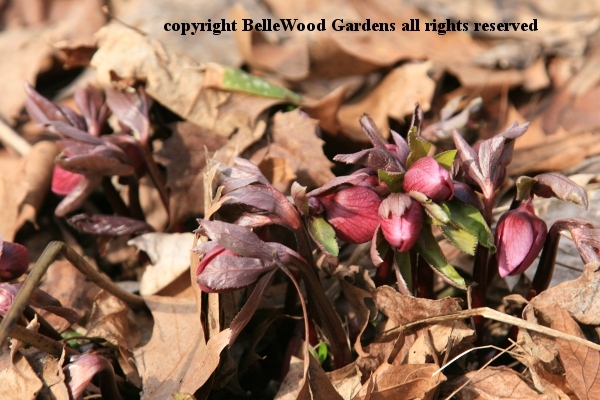 The Helleborus Early Purple Group are lovely in bud and will, weather permitting, soon be in bloom. What a nice walk we've had. Didn't you enjoy that! Let's go back inside for a cup of tea. There will be more to see, when we take another walk in a few days. UPDATE: Winter is not quite through with us. The low temperature on Sunday night was a chilly 20 degrees Fahrenheit. Monday has been hovering at the freezing point, which is 20 degrees below normal. And snow is expected on Wednesday, several inches worth. Stay tuned for later reports from the grumpy gardener at BelleWood Gardens.